This was a day of firsts at Aggborough. Lively midfielder George Porter grabbed his first Welling United goal, Jordan Tunnicliffe saw red for the first time in his career and Antigua and Barbuda international Zaine Francis-Angol wore the historic red and white of Kidderminster Harriers for the first time. 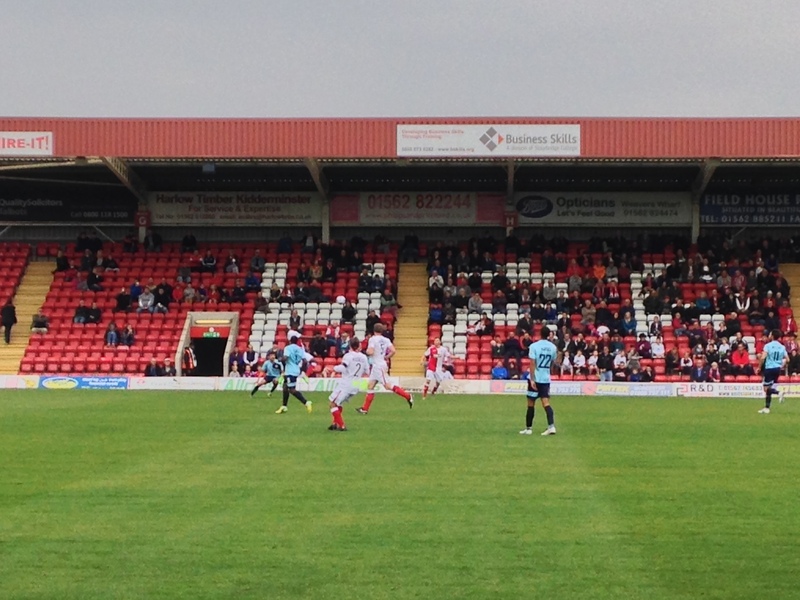 But the most hotly anticipated first – a first victory of the season – continued to elude Harriers. Despite a decent display, backed by the vocal support of the Aggborough faithful, it was another frustrating afternoon for Colin Gordon’s charges. 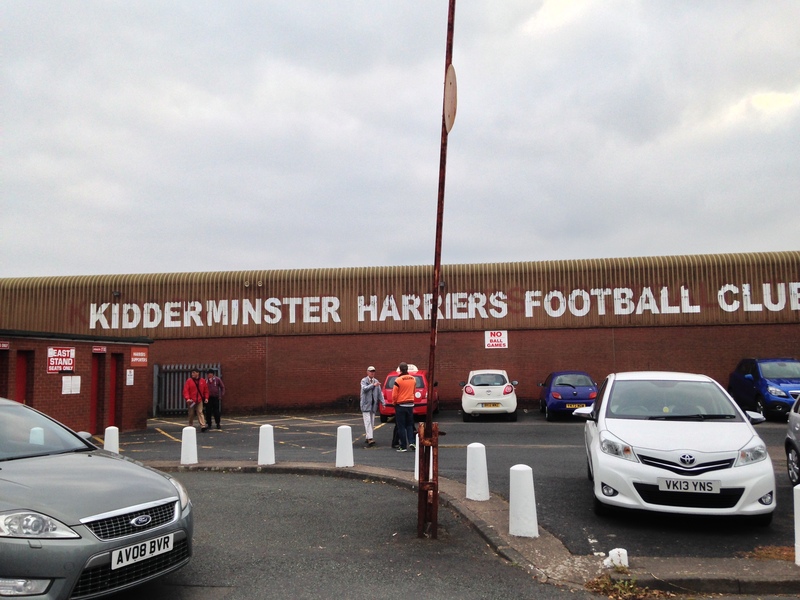 Nestled within the largely green and tranquil Wyre Forest district of Worcestershire, Kidderminster is an unremarkable but fairly pleasant town, best known for its carpet-making heritage and as the home of the county’s only ever Football League club, Kidderminster Harriers. The town’s Wiki page also informs me that it was formerly the home of ‘80s TV chef and UKIP candidate Rustie Lee. Heady stuff. Today’s time constraints mean that the usual pre-match meal in town is scrapped, in favour of a bacon butty (lukewarm – hopefully the football won’t follow suit) and a pint of Hereford Pale Ale (delicious) amidst the bustling environs of the Final Whistle. 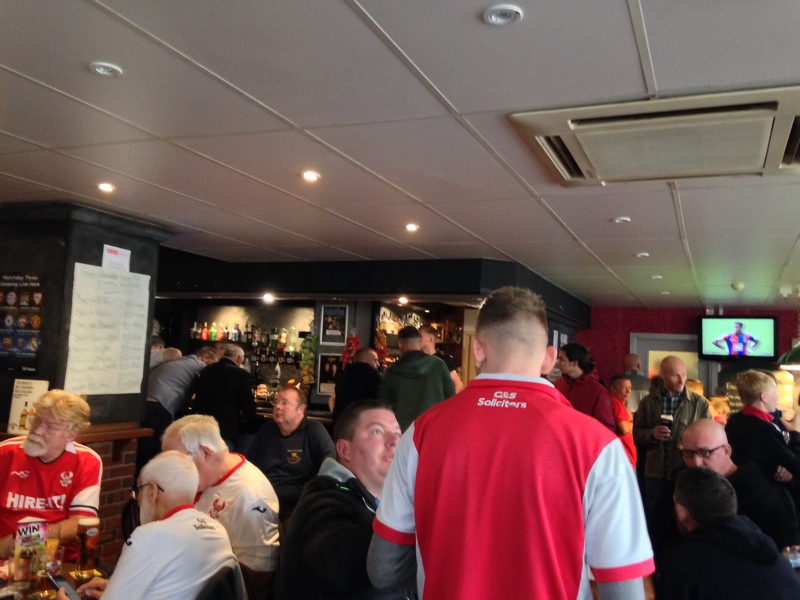 This pub, based inside Aggborough, is one of several spots in and around the ground to settle down with a pre-match pint and bite to eat. With a social club also in the ground, and several good venues nearby, the only lack of options around here is in the Harriers strike force. Here in the Final Whistle, blokes of every age pore over this week’s edition of The Harrier match program, where striker Reece Styche answers fan questions, in the process revealing his love of Leonardo da Vinci and describing why he wouldn’t want to be a slug. As someone who has long objected to the lack of surrealism in Non-League matchday publications, I’m delighted. Pints, predictions and pre-match chats abound in the Final Whistle pub. The mood around the place is surprisingly optimistic. The playing budget at Aggborough has been slashed in half for this campaign, and much-needed cutbacks have been made in other areas too. Right now, Harriers fans may just be happy that the lights are still on here. And there’s plenty of us home. Despite four defeats in the last five home games, there’s 1,438 of us in attendance – including a small but hardy band of Welling fans huddled together upon the South Terrace, proudly tying their flags onto the stand. It’s one of two terraced stands at Aggborough – the North Terrace lying behind the other goal, and housing Kiddy’s most vocal support. I opt for the traditional main stand – the C&S Solicitors Stand – which runs along one side of the pitch, opposite the modern and smart Hire-It! Stand (which, confusingly, is not available to rent). The fairly smart interior of Aggborough belies the fact that this ground is 125 years old, though its largely corrugated exterior evokes either unpretentious tradition or Soviet Russia, depending on how kind you’re being. Harriers’ passionate supporters on the North Terrace reflect on a tight first half. The teams kick-off, backed by an upbeat home support, and in the early stages, this good feeling seems warranted. Kiddy’s Joe Clarke has the first half-chance of the game, but his 4th minute free-kick lands safely in the arms of Welling’s young ‘keeper Tom King. The home side look the livelier outfit throughout the opening 15 minutes, but struggle to turn possession into good chances. Harriers also look nervy in defence, and only the reactions of ‘keeper Alex Palmer stop a goalmouth scramble from putting the visitors ahead just before the 20-minute mark. The hosts continue to play some neat passing football, and the talented Jordan Jones blasts an effort just wide after superb play on the wing. Too many of their moves, though, are breaking up in the final third, against a strong Welling defence who haven’t conceded more than once in any game since August. Tahvon Campbell’s effort – another comfortable stop for King – is the final act of a tight but intriguing first half. 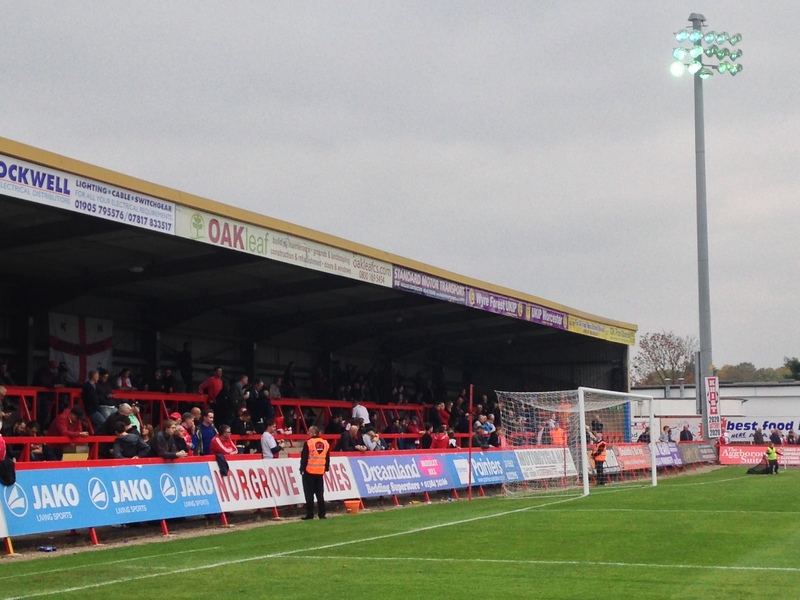 At half-time, fans queue for Aggborough’s famously good food as the theme from The Great Escape booms out over the tannoy. But any plans to escape from 24th spot today are thwarted in the early minutes of the second period, as individual errors enable the skillful George Porter to make his mark on the game. First, his curling free-kick sneaks under Palmer, who should probably have kept it out. Then, a misplaced ball from Hodgkiss allows Porter a clear route through on goal. Jordan Tunnicliffe trips the Welling man, and though the contact is slight, the Harriers’ last man receives a straight red. From then on, the home side’s task looks momentous. Amidst a continued cacophony of chants from the passionate Kiddy fans upon the North Terrace, George Porter continues his role as today’s pantomime villain. The speedy midfielder oscillates between producing exciting moves and rolling around petulantly to try and win free-kicks. Indeed, whilst Welling put in a solid and disciplined footballing performance, a few of The Wings players hope to gain the referee’s sympathy with some rather questionable ‘injuries’. Cynics might suggest that some members of Loui Fazakerly’s side have failed to learn the lessons of the embarrassing and costly Sahr Kabba debacle. Welling look to double their lead on the counter-attack. With that said, Welling also show some of the game’s best flashes of quality. A superb move is almost finished off by the lively Xavier Vidal with a quarter of an hour remaining, but he can’t quite provide the strike needed to double their lead. In the closing minutes, 10-man Harriers surge forwards, but neither Reece Styche’s curling effort nor Kelvin Langmead’s close-range header in injury-time hit the target. The points go to the club from Park View Road, who make it four wins in four. The contrast between the fist-pumping, cheering Fazakerly and the dejected Colin Gordon could not be starker. This has been a decent performance from both sides, in a tense and hard-fought game. But for Kiddy, positives in defeat are hard to take after a 14-game winless run. It may have been a narrow and nervy win for Welling, but Kidderminster would give anything for one of those right now. Already five points from safety, Tuesday night’s game against fellow strugglers Boreham Wood at Aggborough could hardly be more crucial. The distinctive exterior to Aggborough as fans head home, as do Welling (with all three points!). Travel: Kidderminster can be reached by direct train from Worcester, Smethwick or Birmingham’s Moor Street and Snow Hill Stations. The ground is also located close to the convergence of the A448 and A451 roads. 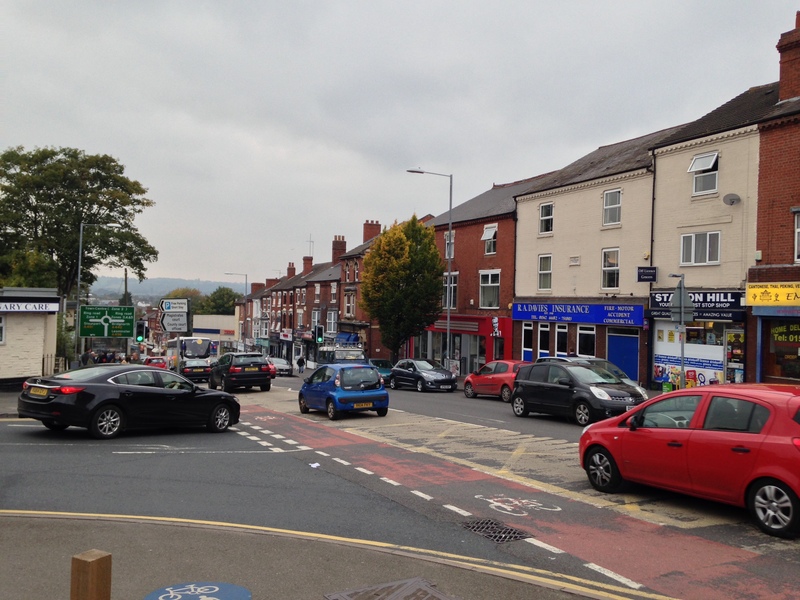 Ground Location: Aggborough lies 0.5 miles south-west of Kidderminster Railway Station, and the same distance south-east of the town centre. Welling United moved to 3rd in the Blue Square South with a 2-0 victory at local rivals Bromley on Saturday. Over 1300 supporters were in attendance at Hayes Lane, with half-price admission and ‘kids for a quid’ for all those who entered before 2pm being the offer of choice for Non-League Day. Sky Sports were also in attendance – focusing on the ‘Kick It Out’ initiative being supported by the two clubs for the game – and a mouthwatering clash was anticipated by the bumper crowd. The Wings had the better of the opening exchanges, with the likes of Joe Healy and Kiernan Hughes-Mason failing to convert their chances, but Bromley striker Richard Pacquette’s deflected shot kept keeper Sam Mott on his toes. Welling kept the pressure up throughout the first half and were rewarded in the 34th minute when a neat interchange between Ross Lafayette and Healy led to the latter with a clear chance, but he unselfishly squared the ball to Theo Fairweather-Johnson with a simple pass that took the keeper and two defenders out of the equation, leaving the Welling number 9 with a simple finish who celebrated with the sizeable travel contingent. The Wings had a lead to take into the break, yet it could’ve been a very different story when the home side’s Michael Malcolm’s neat turn and finish was adjudged to have been offside by the linesman. The second half started at a frenetic pace and the lead was doubled just two minutes after the restart when the Lilywhites defence failed to clear the ball following Healy’s freekick from the left wing, leaving Welling captain and ex-Northern Ireland international Lee Clarke free to swivel and fire home via a small deflection. Bromley were spurred into action by the goal and set about trying to reduce the deficit, with chances for Malcolm and Pier Joseph-Dubois calling Mott into action. Mott was beaten by a Moses Swaibu header just minutes later but the crossbar came to the Wings rescue amidst penalty claims from the home support. At the other header Laffayette responded quickly at a corner, but his header flashed agonizingly wide. Bromley had another penalty appeal turned down towards the end of the game, whilst the away fans were infuriated when play continued after substitute Harry Baker appeared to be impeded when clean through on goal. Despite this, the Wings fans short journey home would still be a happy one when the final whistle blew just minutes later to confirm the victory that sent them 3rd in the league, whilst their opponents dropped to 16th. The home crowd made their way home still largely in fairly good spirits after seeing a good advert for Non-League football and the success of the Kick It Out activities in a year where the topic of racism has been at the forefront of the footballing world. After narrowly missing out on promotion last season with a defeat to local rivals Dartford in the Blue Square South Play-Off Final, Jamie Day’s Welling United have wasted no time in rebuilding the squad for another promotion push next season. Despite losing club captain Jack Parkinson, and highly rated Loick Pires to Blue Square South Champions Woking, and keeper Craig Holloway to Kentish rivals Margate, a number of key players have re-signed for the Wings. Leading scorer Luis Cumbers was the first to put pen to paper, and was soon joined by left-back Jack Obersteller – who was included in the Blue Square South team of the year. Popular midfielder and ex-Northern Ireland international Lee Clarke was next to re-sign, centre-backs Anthony Achaempong and Ben Martin both signed new one year deals and player of the season Loui Fazakerly also sealed a new one year deal. Jamie Day has also strengthened the squad with some exciting new signings. Thamesmead keeper Sam Mott has joined the Wings after impressing in the FA Trophy ties at Bayliss Avenue and Park View Road back in November. Ex-Millwall striker Kiernan Hughes-Mason and prolific striker Jon Main, well known for successful spells at Tonbridge Angels and AFC Wimbledon – have been added to bolster the Wings front line. Promising centre-back Fraser Franks has also been added to next season’s squad, signing from AFC Wimbledon. There are also some mouthwatering Pre-Season Friendlies in store at Park View Road. The traditional pre-season friendly at home to Charlton Athletic is on the 14th of July, followed by a Millwall XI (24th July), the visit of a West Ham XI (28th July), the return of ex-striker Andy Pugh on the 31st of July when the Welling entertain Cambridge United and finally Championship outfit Crystal Palace make the short trip to Welling on the 4th of August. Jamie Day’s men will also travel to Cray Valley (17th July), VCD (19th July), Faversham (21st July), Thamesmead (7th August) and wrap up their pre-season campaign in Surrey at Leatherhead on the 11th of August, before the season gets under way on the 18th August – with the fixtures being released on the 2nd of July. After narrowly missing out on the play-offs two years ago, and coming within 90 minutes of promotion to the top-tier of non-league last season, the Wings are hoping to make it third-time lucky and make it back into the Conference for the first time since their relegation in 20o0.